The colorful fall foliage has mostly disappeared and the natural world seems increasingly drab. 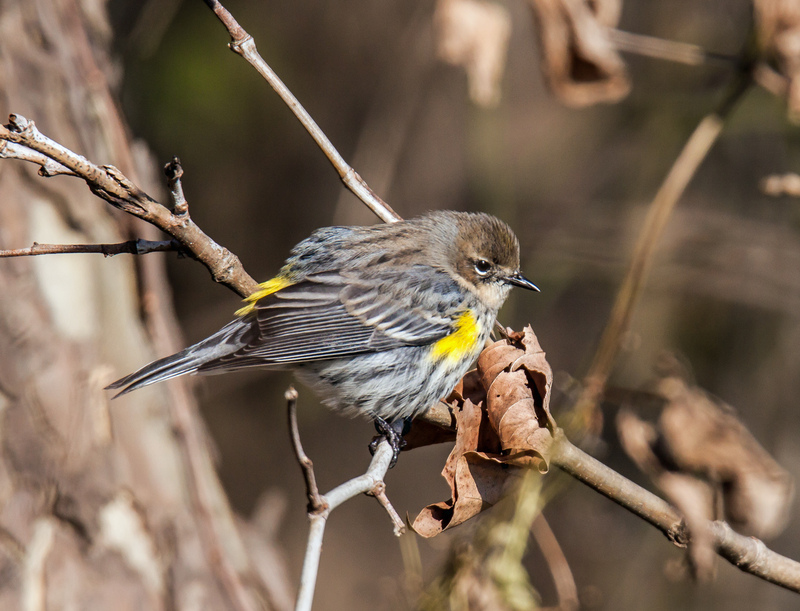 At this time of the year, even tiny touches of bright colors are welcome, like the patches of yellow feathers on this Yellow-rumped Warbler (Setophaga coronata) that I spotted recently at Occoquan Bay National Wildlife Refuge. On many of the Yellow-rumped Warblers that I see, the yellow markings seem pale and faded. I was really struck, though, by the intensity and saturation of the yellow on this particular bird. Yellow is one of those colors that never fails to lift my spirits, even when delivered in tiny doses. These birds are so sweet. Not only that, they’re one of the “flitty little ones” that I can identify. Those yellow patches help — and they certainly do brighten up a day. I think that the warbler is probably pretty well fed and is a bit fluffed up too. Yellow-rumped Warblers seem to hang around with us into the winter, though I am not sure if they are around the entire winter. I like the focus on this, Mike. on November 22, 2018 at 8:04 pm | Reply Molly D.